Now that IT directly supports business, customer's needs are diversifying. YEC Solutions (YEC) has been building and operating systems and is expanding solutions in order to respond to such changes not only in data center operation but in the variety of services provided as an NEC Group company. "For those of us who support data centers, monitoring is our life. Shaking that foundation could result in lower levels of service," said Mr. Sadaharu Inoue, Acting Senior Executive Manager, Service & Operations Division, whose company offers services with the pride of an "infrastructure shop" and deployed Zabbix as a new monitoring tool. Beginning January 2017, the company plans to roll out a Zabbix build support service for customers who want to introduce monitoring infrastructure at their companies. YEC started operating data centers in 2003, offered virtualized hosting and BPO services in addition to basic housing as it supported the creation of an environment that would allow customers to focus on core businesses. In spite of cries for digital administration, current trends in system expansion prevail. On top of that, widespread adoption of virtualization technology has made multiple virtual servers running on a single physical server a matter of course, and set the course for steady increase in resources to be monitored. Having previously monitored internal data center resources by deploying commercial monitoring software, the issue of increasing resources to be monitored is one YEC cannot ignore. At this rate, licenses for the monitoring software are also increasing in proportion to increases in virtual servers, making cost inflation self-evident. Such necessities are the reason why Zabbix emerged as the company started to search for the next option. Open source software-based Zabbix was attractive because deployment costs could be contained without need to worry about additional license fees even if the number of resources to monitor increased. Mr. Inoue made only one request regarding the choice of monitoring solution. He wanted "to select the solution with a full range of support and that would conduct thorough troubleshooting." It was also essential that a Japanese company exist that offers stable Japanese-language support and information. Mr. Yasuo Watanuki of Data Center Infrastructure Services Division, Service & Operations Business, who taught himself in the open source version of Zabbix to improve his skills as an engineer, recalled that he "decided it would work because there is a solid Japanese branch office offering support." All of these were reasons behind YEC's February 2016 decision to introduce Zabbix 3.0. First, a monitoring infrastructure was built in Zabbix for new customers using Zabbix turnkey solutions in July 2016, followed by a transition from the traditional monitoring software conducted serially from September 2016. Engineers from Zabbix Japan used turnkey solutions to support on-site installation work during the deployment. Mr. Masakazu Miyata, Chief of Data Center Infrastructure Services Division, Service & Operations Business, reflected, "We certainly had some reservations at the initial deployment, but using turnkey solutions on the build together with Zabbix sometimes allowed us to configure settings on the spot and learn together as we built. Even after the build, we know we can ask immediately if we aren't sure about something, which is reassuring." The company was also building a template for the initial deployment along with Zabbix in a turnkey solution. Doing so made it much easier and overwhelmingly reduced the time needed to configure settings. It also helps by preventing individual differences for uniform quality of configurations," Mr. Miyata added. Zabbix also employs agent architecture that precludes the need to worry about detailed information changes that accompany changes and additions to resources to be monitored. This also led to a reduction in the operation and configuration load. We are also satisfied with the monitoring capabilities themselves. "The commercial monitoring software we had been using sometimes did not allow us to obtain data that the software specification indicated could be obtained, and parts of the service were difficult to extend. YEC believes that capability to view server status from a variety of angles and respond quickly to statuses is very important. It's not just alive monitoring, but the monitoring of the service from the customer's standpoint that it most important, so we need monitoring to be as close to that ideal form as possible," adds Mr. Inoue. "We used to get alerts that the "CPU utilization has reached the threshold value." But with Zabbix, we can now view raw data that tells us what the percent of actual usage is and can check it from a number of angles, resting assured that we can make a comprehensive decision about what status the server is in. The ability to communicate multifaceted information to systems engineers helps them formulate appropriate responses," Mr. Miyata adds. YEC has been working on shifting business operations from traditional software development to services that leverage knowledge and experience. Data Center Services is, so to speak, on the heels of this shift. Mr. Inoue notes that "while detecting a problem is important, the other two concepts of how to appropriately determine when a problem occurs, and how to prevent a problem will be more important in the future at data centers" as companies pour effort into providing even more high-quality data center services. Additionally, YEC plans to participate in the Zabbix Partner Program to introduce Zabbix build and deployment support services to customers. "YEC's goal is to provide service that leverages knowledge and experience to deliver more convenience and ease of use to customers," says Mr. Miyata. For this purpose, YEC engineers obtained credentials to become Zabbix Certified Specialists as part of a system to provide customers reliable service. Mr. Taketo Shinoda of Data Center Infrastructure Services Division, Service & Operations Business, recalls "when I took my Zabbix training, I got answers quickly to things I did not understand, and we look forward to providing service that responds to and supports customers in the same way." "The infrastructure should never stand out, but should be there as a matter of course, and run as a matter of course. That is why it's the most exciting area, and why we continue to pursue quality with our own policies," Mr. Inoue said. With Data Center Services supported by detailed monitoring at the core, YEC works to monitor the pulse of industry trends like log analysis and IoT that can be integrated in services the company offers. 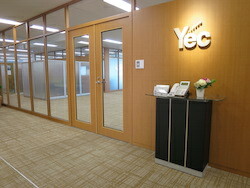 Since incorporation in 1969, YEC Solutions, Inc. has provided a wide range of effective, secure and high-quality services ranging from consulting services for ICT utilization, system build and operation services, development of industrial software, ASP services that utilize in-house iDC and BPOs. In addition, YEC is working on a number of management standards as a result of contributing to the development of local communities and customers through the solutions business. YEC grows in lockstep with customers, providing support in a secure system that enables customers to effectively leverage ICT technologies so they can focus on their core businesses.